Tracking your menstrual cycles and calculating when you are fertile can lead to a form of birth control known as the calendar method. The calendar -- or rhythm -- method is a type of fertility-awareness method of birth control. The calendar method works by calculating your fertile window based on your menstrual cycle. Abstinence or a barrier method is then used during the time of fertility to prevent pregnancy. Consult with your doctor or a trained fertility-awareness professional to develop a plan that is right for you. To use the calendar method, first look at your menstrual cycles over 6 to 12 months. Then determine the length of your menstrual cycles by counting the number of days from the first day of one period to the first day of your next period. To calculate your fertility window, select the longest and shortest cycles and then subtract 20 from the shortest cycle and 10 from the longest cycle. For instance, if your cycle varies between 28 and 35 days, your fertile window would start on the 8th day -- 28 minus 20 -- after the start of your period and end on the 25th day -- 35 minus 10. During this time frame, abstinence or a barrier method is required to prevent pregnancy. Another way to determine your fertile window is called the standard days method. It only works if you have regular cycles that last between 26 and 32 days. In this method, you do not have to do any calculations because day 8 through day 19 after the start of your period are automatically considered to be the fertile window. Color-coded beads are available to assist with tracking your fertile and infertile days. Unfortunately, if your cycle varies or is outside the 26-to-32-day range 2 or more times within a year, this method is not reliable. Other ways to determine your fertile window include charting changes in your temperature or cervical secretions. Combining these other indicators of fertility with the calendar method improves the overall effectiveness at preventing pregnancy. The authors of a March-April 2009 review in the "Journal of the American Board of Family Medicine" reported that modern fertility awareness-based methods have a pregnancy rate of 1 percent to 3 percent. This is similar to the rate for other available birth control methods. 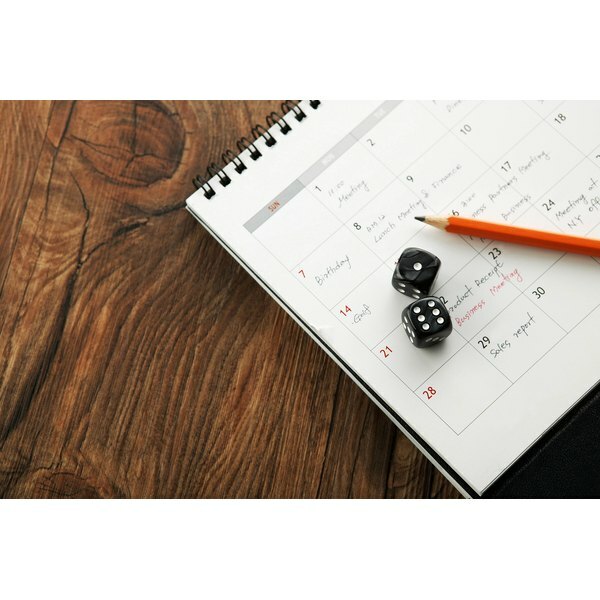 The calendar method has several advantages, including its low cost, lack of hormones or chemicals and no side effects. It can be effective for motivated couples. Because it requires a change in sexual behavior during the fertile window, couples must cooperate and communicate, and this may increase intimacy. According to a March-April 2009 review in "JABFM," couples using natural family planning methods, such as the calendar method with abstinence, have a significantly lower divorce rate than the general population. But some couples find either the charting or abstinence difficult, and the calendar method can be difficult for women without regular cycles or during times of stress or hormonal changes. Consult a health care professional trained in fertility awareness to fully explore your options. Comprehensive Gynecology; Morton A. Stenchever, MD, et al. Is This App Really as Good as the Pill?